To please the High-end Smartphone lovers, Motorola has launched all new Motorola Moto X Force in Indian market priced at priced at Rs 49,999 for 32 GB and Rs 53,999 for 64 GB variant. It is available through Flipkart Black Ballistic Nylon color option from 3rd Feb. 2016. It’s rivals are Apple iPhone 6 Plus, Sony Xperia Z5 Premium. The all new Motorola Moto X Force supports Single-SIM(Nano SIM), 4G LTE, with TE Cat 4, Bluetooth, Wi-Fi, Micro-USB, and GSM/ EDGE/ HSPA+ comes with a 5.4-inch QHD display with resolution (144×2560 pixels) with Corning Gorilla Glass 3 protective offers stunning colour consistency and immersive stereo sound from front-facing speakers. with wide angle-view perfect for watching movies, playing games, web browsing and reading e-books. Motorola Moto X Force runs on Android 5.1 Lollipop powered by powerful 64-Bit Octa -core Qualcomm Snapdragon 810 processor clocked at 2GHz with 3GB of RAM makes your multi-tasking breezy and creates immense gaming environment and reducing hit allows to run your apps smoothly while 32GB/64GB in-built memory 2TB MicroSD card slot offers enough space to store your favorite data. 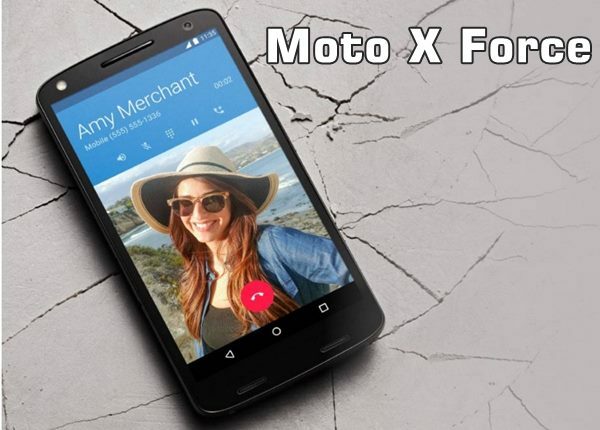 Motorola Moto X Force offers you huge 21-MegaPixel rear camera with dual-LED flash, CCT (Colour Correlated Temperature), Phase Detect Auto-Focus (PDAF), autofocus and f/2.0 aperture perfect for shooting in low light condition and a 5-MegaPixel front camera for video calling and selfies. Motorola Moto Turbo powered by a powerful 3760mAh battery with Turbo charging 10 hour battery life in 15 min (Quick Charge 2.0) offers you battery life up to 48 hours for mixed uses measures 149.80 x 78.00 x 9.20 and weight just 169gm including innovative features like Water repellant Nano-coating (IP52 certified), Moto Assist, Moto Display, and Moto Voice. Lenovo owned Motorola recently launched Motorola Moto X Play priced at s. 18,499 for 16GB and Rs. 19,999 for 32GB than launched Moto X Style priced at Rs. 29,999 for 16GB and Rs. 31,999 for 32 GB. The all new Motorola Moto X Play supports Dual-SIM(Nano SIM), 4G LTE, with TE Cat 4, Bluetooth, Wi-Fi, Micro-USB, and GSM/ EDGE/ HSPA+ comes with a 5.5-inch Full HD display with resolution (1020×1920 pixels) and pixel density of 403ppi with Corning Gorilla Glass 3 runs on Android 5.1 Lollipop powered by powerful 64-Bit Octa-core Qualcomm Snapdragon 615 processor clocked at 1.7GHz with 2GB of RAM, 16GB/32GB in-built memory . Motorola Moto X Play offers you huge 21-MegaPixel rear camera with dual-LED flash, CCT (Colour Correlated Temperature), Phase Detect Auto-Focus (PDAF), autofocus and f/2.0 aperture perfect for shooting in low light condition and a 5-MegaPixel front camera for video calling and selfies powered by a powerful 3900mAh battery with Fast battery charging 60% in 30 min (Quick Charge 2.0) offers you battery life up to 48 hours for mixed uses and offers you 7 hours of battery life in just 15 minutes of charging measures 148x75x10.9mm and weight just 169gm. While The all new Motorola Moto X Style supports Dual-SIM(Nano SIM), 4G LTE, with TE Cat 4, Bluetooth, Wi-Fi, Micro-USB, and GSM/ EDGE/ HSPA+ comes with a 5.7-inch QHD display with resolution (144×2560 pixels) with Corning Gorilla Glass 3 runs on Android 5.1 Lollipop powered by powerful 64-Bit Hexa -core Qualcomm Snapdragon 808 processor clocked at 1.8GHz with 3GB of RAM, 16GB/32GB in-built memory 128GB MicroSD card slot . Motorola Moto X Style offers you huge 21-MegaPixel rear camera with dual-LED flash, CCT (Colour Correlated Temperature), Phase Detect Auto-Focus (PDAF), autofocus and f/2.0 aperture perfect for shooting in low light condition and a 5-MegaPixel front camera for video calling and selfies. Motorola Moto X Style is powered by a powerful 3000mAh battery with Turbo charging 10 hour battery life in 15 min (Quick Charge 2.0) offers you battery life up to 48 hours for mixed uses measures 153.90 x 76.20 x 11.06 and weight just 179gm. At last few honest word, the all new Motorola Moto X Force is the best smartphone of the year. What you think.? Please be open to give your view.